Now there is this women’s Darth Vader Will You Be My Valentine Sweatshirt that is just made for true Star Wars fans. 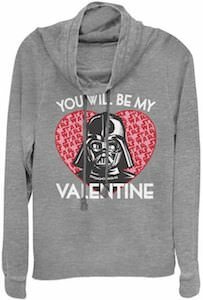 This is a light gray sweatshirt with on the front a big red heart that says “Star Wars” in the background and on top of it there you find Darth Vader and then around the heart it says “You Will Be My Valentine” because Darth Vader only gives firm commands. 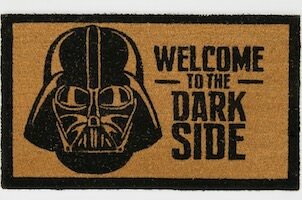 So now you don’t have to worry about finding someone special this valentine because Darth Vader has you covered. You can get this Star Wars sweater in women’s fitted sizes XSmall – 4XL for the perfect fit on you. 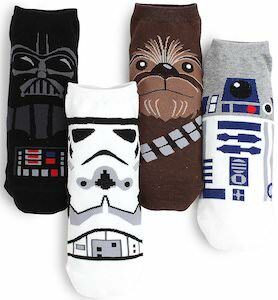 Not one but 4 pairs of Star Wars socks are in this set so if you are a Star Wars fan then you are in luck. The socks have Darth Vader, Stormtrooper, Chewbacca, and R2-D2 on it and they will work on both men and women and they are made from 80% cotton, 15% polyester, and 5% spandex. And if you loose one of the socks then just mix and match because you still have Star Wars on your feet and have R2-D2 on one foot while having a Stormtrooper on the other will be just funny and sometimes we just want something funny to look at. 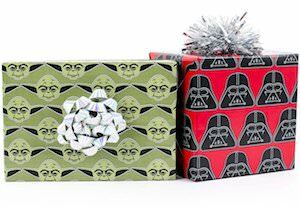 Now there is Yoda & Darth Vader wrapping paper so that the presents for Star Wars fans can be wrapped in style. The Hallmark wrapping paper includes two rolls of 30 inch wide and 10 yard long wrapping paper. One of the rolls is red with the black helmet of Darth Vader on it and the other role is green with the face of Yoda on it. So now all the presents for a Star Wars fan can be wrapped in this Star Wars gift wrap and the green and red paper work great together so that it will look stunning if you have a whole stack of Star Wars presents wrapped in this wrapping paper. 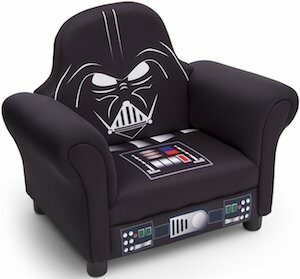 If you like Star Wars and tea then you just need this Darth Vader tea set. 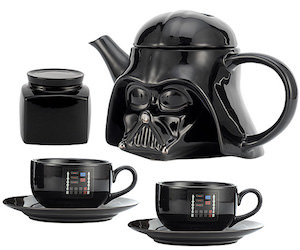 The tea set includes a teapot that looks like the helmet of Darth Vader and then there are two cups and saucers that are also Darth Vader themed with part of his outfit on them and then finally there is a black sugar jar to make the set complete. The ceramic tea set makes for the perfect the perfect present for yourself and for any Star Wars fan in your life. So tea time will be better than ever because now you have the perfect tea set for enjoying tea and talking Star Wars with a friend. 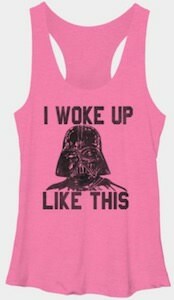 If you are a woman that love Darth Vader from Star Wars then you have to check out this pink Darth Vader tank top. The tank top has a racerback and comes in women’s sizes Small – XL and is only available in this nice pink color. On the top, you will find the black helmet face of Darth Vader and around the Dark Lord you find the text that says “I woke up like this” and you, of course, did not look like Darth Vader when you woke up but you probably would look amazing and this Star Wars tank top only would make you look even more amazing. If you like to work out in Star Wars style then you just need these workout capris that want you to use the force. These women’s leggings are black and grey with a galaxy far far away on it. 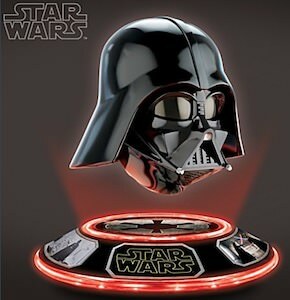 On the side, there is a black bar going all the way down that says “Use The Force” and shows the helmet of Darth Vader. And there is a matching Sports Bra too. These Star Wars capris are perfect for a workout and they are made from 86% polyester and 14% spandex for ultimate comfort and there is a hidden zipper pocket that can hold something small like your locker key.